How Some Epic Stair Crawling Reminded Me To Expect The Unexpected! You are here: Home / Parenting / How Some Epic Stair Crawling Reminded Me To Expect The Unexpected! This kid is seriously on a roll lately. 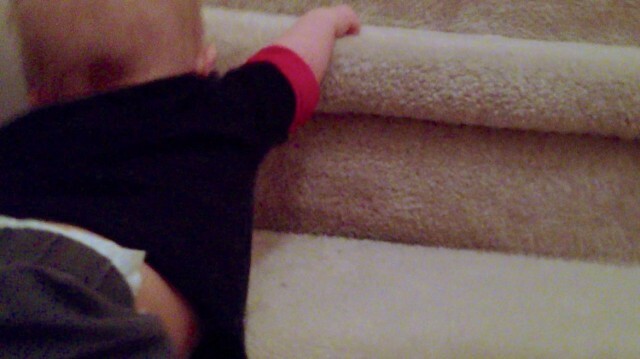 He just learned to climb up a few steps a few days ago, and as you can see in today’s video, he’s already almost able to make it to the top of our staircase at home! I’m so proud of this little boy! He’s hard at work learning to climb these stairs. Isn’t it fun how our kids just decide to up and surprise us sometimes? 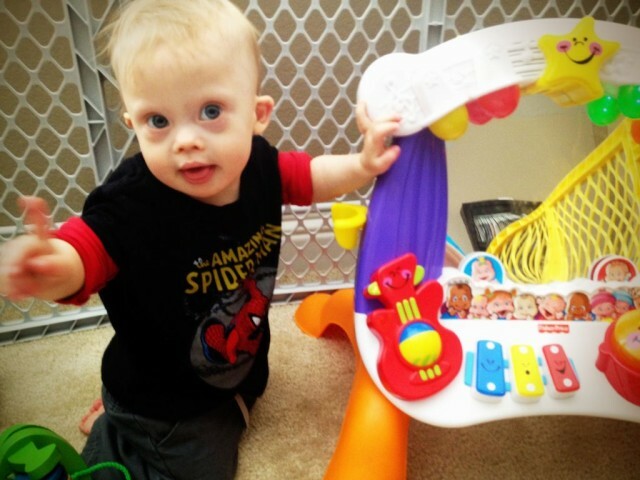 As I mentioned, it was only a few days ago when we blogged about Noahclimbing up a few steps at occupational therapy (and shared some tips on how you can help your child do the same.) 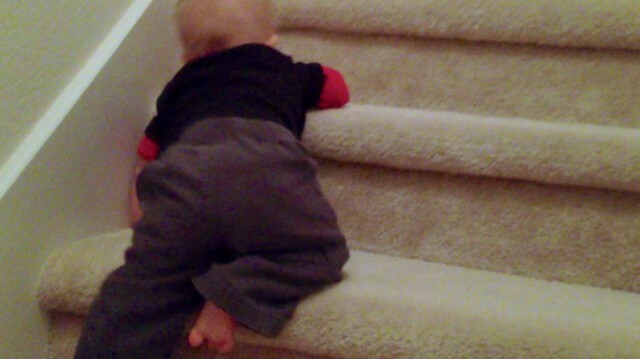 So tonight we were just playing around at home practicing what Noah had learned in therapy the other day…and hoping he would take a few steps on our staircase at home….when BAM! Out of nowhere he just decided to blow us away and make his way (almost) to the half-way point for our staircase! You Never Know When Your Child’s Going To Surprise You! Today could be the day your child blows you away….again! I’ve said this before, and I’ll say it again; you really never know when your child is going to decide to just out of the blue surprise you by doing somethingawesome! In no way I was expecting Noah to just take off up the stairs like he did tonight! He just decided he wanted to do it, and off he went with it! This is also the same thing that happened when he first started crawling. We assumed that Noah was going to go from inch worming / rolling around to walking, and just sort of skip crawling all together (which not uncommon in children, by the way.) So we weren’t even expecting him to start crawling. Then one day while we were playing around in his nursery….BAM, he just took off and started crawling. Once again, It was awesome! The same thing also happened when he learned to sit up on his own. And once again….it was awesome! So I’m starting to see a pattern develop as I watch Noah grow and develop. The pattern is this….this is no pattern! Whatever I expect to happen, probably isn’t going to happen. So I guess you could say it’s better to expect the unexpected! In fact, I think a former Denver Broncos player told something along those same lines one time! So if you’re reading this and you’ve been a little discouraged lately about your child’s progress, I just want to encourage you by reminding you that you never know what’s around the corner for you child. Heck, today could be the daythat your child decides to amaze you by reaching a milestone that you thought was a long way away! And even if they don’t, who cares? They sure don’t. As my wife so eloquently put it, let’s make habit out of celebrating, not comparing our children. There’s no one else in the world like your child. They are their own person and will grow and develop in their own unique way as well. Enjoy Being A Parent Today. You’ll have seasons where it seems like every day your child is reaching another developmental milestone….and you’ll have seasons where you feel like they’ll never reach another one. And they are just that, seasons. They come, and go. So don’t get to attached to attached to any certain one. Instead just remind yourself of how much fun it is to be a parent, and go have some fun today! Heck, maybe you just need to turn the music up and dance today. You have my permission. What are you celebrating in your house lately? What goals are you working on? Leave a comment below and tell us about it. (I’ll go first; We’re celebrating Noah crawling up the stars on his own today! And we’re working hard on getting him to take his first steps.) Now it’s your turn. 1, 2, 3, go…..